Background Connective tissue disease – associated pulmonary artery hypertension (CTD-PAH) has a worse prognosis compared with idiopathic pulmonary arterial hypertension (IPAH). We investigated the prognostic significance of left and right cardiac dysfunction in IPAH and CTD-PAH. Methods and results Between 2003 and 2011, patients with a new suspected diagnosis of pulmonary hypertension underwent diagnostic assessment including cardiac magnetic resonance (CMR) imaging and right heart catheterization (RHC). 138 patients fulfilled the criteria for pulmonary arterial hypertension, of which 74 were diagnosed with IPAH and 38 were diagnosed with CTD-PAH. At baseline, there was no significant difference in age, functional class, lung function or six-minute walk distance between the two groups. At CMR, both groups had right ventricular (RV) dilatation and impaired RV systolic function, but well preserved left ventricular (LV) ejection fraction. 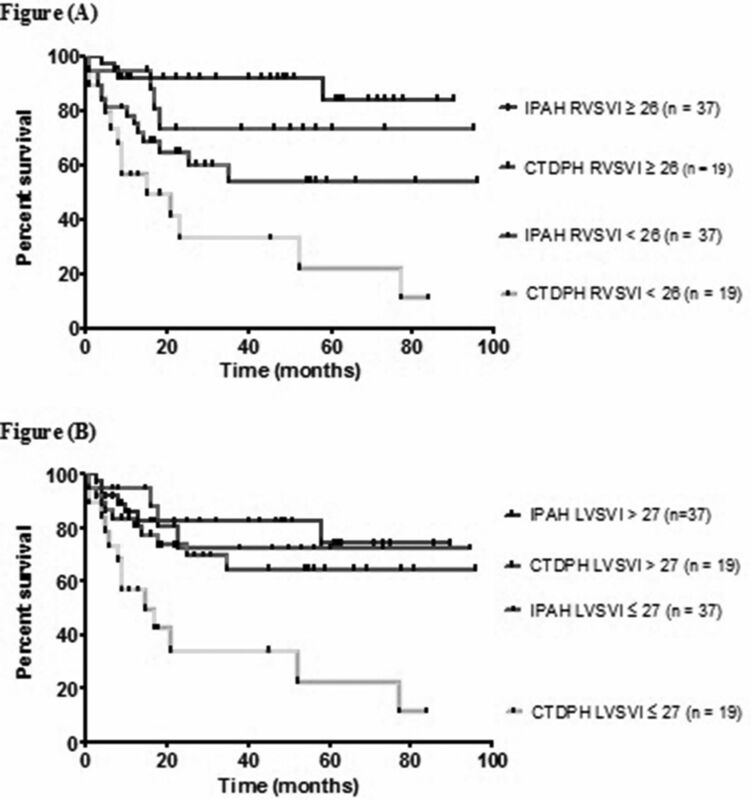 Patients with IPAH had greater right ventricular hypertrophy than those with CTD-PAH (VMI 1.16 v 0.99, p = 0.03). Left atrial volume, a marker of LV diastolic dysfunction, was lower in IPAH than CTD-PAH (23 v 33 ml/m2, p < 0.0001). At RHC, mean pulmonary artery pressure was higher in IPAH than CTD-PAH (50 v 43 mmHg, p = 0.01). There was no difference in the distribution of initial disease-targeted therapies between the groups. Survival was better in IPAH than in CTD-PAH (p = 0.03), with rates of 83% at 1 yr and 74% at 3 yrs in IPAH, but 75% at 1 yr and 53% at 3 yrs in CTD-PAH. Poor baseline right ventricular function was associated with reduced survival in both conditions. However, poor left ventricular function, as measured by left ventricular stroke volume index (LVSVI), only influenced survival in CTD-PAH (p = 0.002) and not in IPAH (p = 0.21). Conclusions Poor LVSVI at diagnosis is associated with impaired survival in CTD-PAH but not IPAH. Intrinsic LV problems, particularly diastolic dysfunction, may contribute to the excess mortality in CTD-PAH.